Titusville is a quiet community situated between I-95 and the Atlantic Ocean. A river does run through it – the scenic Indian River! From its banks you can find marvelous spots to fish and view spectacular space shuttle launches. You can reach Titusville from I-95 exits 79 and 80. Several of the major hotel chains do business here, including Best Western and Holiday Inn. For an inexpensive stay right on the highway, try the Luck’s Way Inn, 3655 Cheney Hwy. (SR 50), Titusville. Take I-95 exit 79 and head west at the end of the ramp. For a great view of the Indian River and shuttle launches, try the Holiday Inn Kennedy Space Center, 4951 S. Washington Ave. (US 1), Titusville. Titusville abounds with places to eat. A must-try for barbeque is Sonny’s Bar-B-Q, 2900 Cheney Hwy. (SR 50), right across from the Wal-Mart. Take exit 79 and head east at the end of the ramp. For a taste of Southern charm, try Kloiber’s Cobbler Eatery, 337 S. Washington Ave. (US 1), Titusville. Take exit 79, head east on Cheney Hwy. (SR 50); at the Indian River, turn north (left) on Washington Ave. (US 1). You will go north for several miles through the city to the downtown district; once in the downtown district, Kloiber’s will be on the right, just south of Garden Street (SR 406). A trip to Titusville is not complete without a stop at Dixie Crossroads, 1475 Garden St. (SR 406), Titusville. Take exit 80; at the end of the ramp head east on Garden Street (SR 406). Dixie Crossroads is across from the 7-Eleven, one block west of the intersection of Garden and Park. This beautifully landscaped restaurant specializes in seafood. There are several chain restaurants at exit 79 (SR 50). Titusville is the place to go if you want to see space shots. The Kennedy Space Center Visitor Center can be accessed from exit 79. Go east on Cheney Hwy. (SR 50); in front of Wal-Mart turn right onto Columbia Blvd. (SR 405) and proceed directly to the launch pads. The Astronaut Hall of Fame and U.S. Space Camp are on the way there. Titusville has five major roadways as reference points: I-95 running north and south; Washington Ave. (US 1) running north and south along the Indian River; Cheney Hwy. (SR 50) off exit 79 which runs east and west; Garden Street (SR 406), which runs east and west off exit 80; and SR 405, which is known as Columbia Blvd. to the south of Cheney Hwy. and South Street to the north of Cheney Hwy. I’am sorry to say that Val’s is no longer in business in Titusville. I can say that Val is in the catering business. He is catering special events and parties. It is a pleasure to be Val’s friend and to experience his fine skills in the culinary field. I will request Val put his new information on several Websites so he may easily be reached. It’s fine to brag about southern, but … you need to mention Vals’, a European dining treasure, specializing in Polish food. Delicious food is complimented by excellent service and pleasant atmosphere. I have visited Titusville 2 times but it was Val’s that brought us BACK. On a good, clear day the Shuttle can be viewed for two minutes. 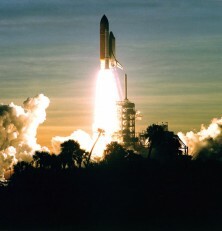 Once the Solid Rocket Boosters drop off, it’s no longer considered a Shuttle, but the Orbiter and External Tank can be viewed for another two minutes – Four minutes in total.